Private outdoor BBQ area and flat, large garden ideal for a family holiday . The Nelson Lakes and Golden Bay are both an easy day trip and Nelsons Market, held every Saturday, is well worth a visit for New Zealand made arts and crafts and fresh local produce. The challenging Tasman Golf Club, 1km past the gate, welcomes visitors. Not a golfer..... its worth the walk or a drive, for the stunning views over Tasman Bay and the bar might be open! With safe swimming, boating, and fishing, plus award winning local vineyards and NZ's best cafe winner, Kina Beach really is the perfect holiday location. 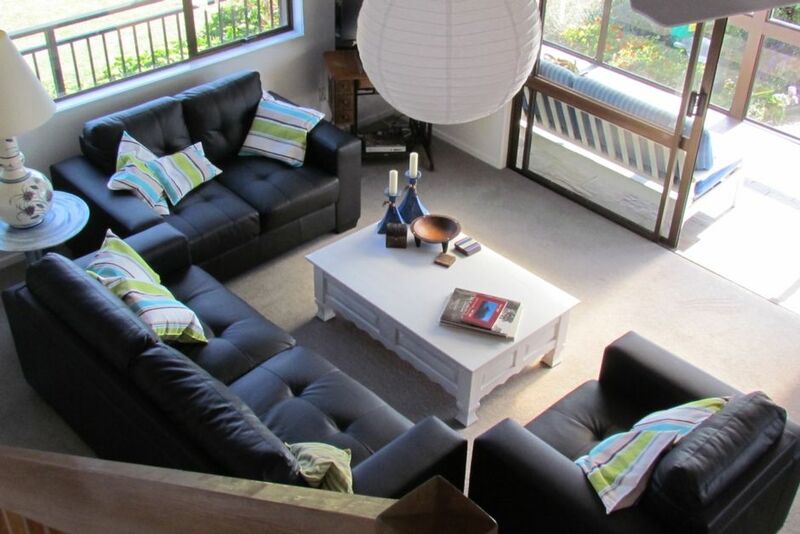 Atatu Beach House is only a 25minute drive from Nelson airport. The large open plan living area offers SEA VIEWS from every window. The house is a split 3 level home, with garaging underneath and the kitchen/ living/ dining area on the 2nd floor. Bedrooms are accessed via stairs of this area. On the top floor you will find the Master Bedroom / Ensuite bathroom with shower and toilet. The Mezzanine Bedroom is also on this level, with 2 King Single beds and also 2 x std single trundler beds. On the lower level is the Queen Bedroom, Bathroom with bath / shower and a separate toilet. We have plenty of outdoor furniture. Commercially laundered linen is supplied. Great location, but unsuitability of access for elderly clients, detracted from the overall appeal. Our party of four are all in their eighties and three had mobility issues with the 14 steep stairs to the front door, plus the stairs upstairs. Would not have proceeded with the booking if the access challenges had been illustrated by way of any photos or in the property description. Having said that, the kitchen/dining and lounge areas were fine. The glassed in porch was a winner in terms of sun trap and views. A property for the younger in heart and limb. Pity the marketing of this property appeared to ignore the difficulties for the older demographic. Apologies for any confusion regarding the layout of the house. I did meet these guests on arrival and they seemed very happy with the house and certainly made no mention of the stairs. Our photos do clearly show stair rails and views that obviously are not taken from ground level. We do also mention that the bedrooms are on different floors of the house. I have now added a photo of the internal stairs for extra clarity, the stairs are all standard and in no way 'Steep', they also have handrails. My 84 year old father has stayed many times and shows no difficulty with access, so it has never occurred to me that other 80 yr old's in general health would struggle. I would recommend that any guest with 'mobility issues' should always check on the specifics of the property they are booking. We are always happy to answer any queries about our property. Great spot, quiet and relaxing, yet close to all the amenities for easy day trips. A nice, peaceful place to stay with lovely views across the bay. Thanks to our children we got to see some beautiful sunrises. Very close to Motueka and Mapua and only 20 minutes from Richmond, it’s a great central location for access to our favourite areas of the Tasman area including Golden Bay and the Abel Tasman National Park. The ceiling fans and heat pump were good for climate control and the beds were very comfortable. We definitely hope to stay here again in the future. Lovely warm. clean and cosy house in a great location. Would love to stay again. Lovely relaxing spot. Very comfortable house with everything you need. Absolutely amazing house. The views are spectacular, beach just across the road.